Jim, Jim, he’s our man, if he can’t do it, no one can!!! As juvenile as the cheer may seem, it speaks to what could be the harsh reality for the University of Michigan football program. I know you think that I need to be an optimist and hope for the best, and I am, but after bearing witness to under-achievement on, and off the field, during the tenure of two coaches who had no business leading the maize and blue out of the tunnel, I have become a battered fan. The biggest thing that I learned from the Rich Rodriguez short-lived era in Ann Arbor is that there is so much more that impacts a football program outside of recruiting, spring practices and games in the fall. Major college football is about relationships and traditions that go far more profound than most understand, and that is what eventually doomed Rodriguez. From not welcoming back former players to the egregious assigning of the #1 jersey to a defensive back, Rodriguez showed that while he was an innovative offensive mind, he was not smart enough to assimilate to program’s traditions and history. Some will argue Rich Rod was the booby prize after striking out on more notable coaching candidates — including former Wolverines offensive lineman and current LSU head coach Les Miles. What many casual fans didn’t realize was that even the courtship of Miles — whether it happened or not, depending on who you ask — was marred with bruised egos and miscommunication. Despite the mishaps off the field, all would have been forgiven if his quirky read-option spread offense and unbalanced 3-3-5 defense would have translated into more victories — but it didn’t, and he became the scapegoat for everything that went wrong in Ann Arbor and was eventually replaced. Fans rejoiced as the outsider, who did not understand what it meant to be a “Michigan Man,” was sent packing and the process of finding the guy to get Michigan back to its rightful place — as a top program in college football — started again. What those fans did not realize at the time was that the Rich Rod debacle exposed an ugly truth about the state of college football — one that Wolverines fans weren’t ready to deal. No one cared about Michigan football anymore! 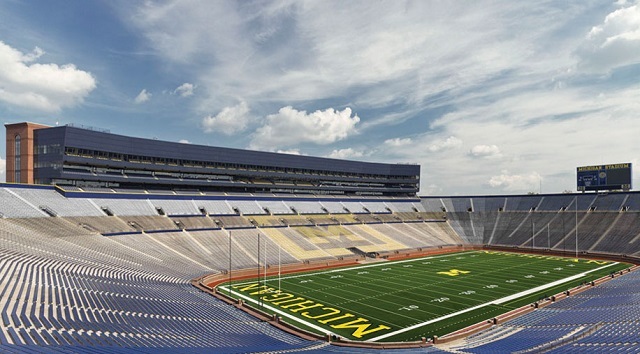 Sure you still had a handful of recruits that were wooed by the winged helmet and admired the opportunity to play in the “Big House,” but not to the levels that it was in the 80s, 90s, and early 2000s. During the program’s heyday, all a previous coach had to do was get a recruit on campus say “this is Michigan” and more times than not the guy would sign up with little hesitation. Scholarship reductions combined with the expansion of media exposure for teams across the nation meant that little Johnny from Kansas could choose a program like Boise State and play early. His parents could now see him on television just about every week, and he would still have a solid chance of making it to the NFL — all promises that many of the blue blood programs in college football, especially Michigan, used as their selling pitch back in the day. But even with the change of the national recruiting landscape, you had to assume that the Wolverines were still was the team of choice within its state, right? Not so fast, even with the success of the program in the mid-2000’s, there was a new generation growing up in the Great Lakes state that did not have an allegiance to the winged helmet. The 2007 recruiting class revealed that as only four of the top 15 players in the state of Michigan chose U-M (none selected MSU) — and with the hiring of Rodriguez it just seemed to get worse. In the first two full recruiting classes for Rodriguez, it was apparent that priorities of the staff were not the in-state recruit as less than 25% of the top players in Michigan for the 2008 and 2009 recruiting class chose U-M. In 2008 only three of the Top 15 players chose in-state rival Michigan State, but that number jumped to seven the following recruiting cycle — with two signing with Ohio State. It is evident that U-M had lost its foot hole in its backyard, but for some, it was an even trade-off because now the staff was finding success attracting talent from Florida. In that same two-year span U-M was able to pull 11 players out of the sunshine state, and while some weren’t as highly regarded according to recruiting websites, many fans felt that a three-star recruit from a talent-rich area of Florida could be better than a four-star recruit from Michigan. In some cases they were correct as we eventually saw a little-recruited quarterback from Deerfield Beach, FL rewrite the school’s record books in Denard Robinson, but there were also plenty of failures like Adrian Witty and Vlad Emelian who never made an impact. With U-M focusing on “bigger fish” nationally, Michigan State took advantage of their rival ignoring the local talent and created relationships with area coaches and families that U-M still is trying to overcome to this day. Even those who grew up rooting for the maize and blue were passed over by Rodriguez, but MSU made sure to welcome those talented players into the Spartan family with open arms, and that created a boulder-sized chip on their shoulders, and it showed on the field. U-M lost all three rivalry games led by Rodriguez, and the score differential did not tell the full story. To say MSU emotionally punked the Wolverines on the gridiron would be an understatement and the mentality of superiority that developed in those wins still carries on now as U-M has only won one game in the last seven seasons. Once those in influence realized their mistake in Rich Rod, they began scrambling to find out who his replacement would be. Once again the rumors started about Miles being the best option, and like before nothing materialized, but one thing was known within the hallowed halls of Schembechler Hall, whomever the next coach was, it had to be someone with Michigan ties. And that’s who they selected, Brady Hoke, a former player, and defensive coach who went on to have marginal success at Ball St. and San Diego St., the fanbase was excited: a coach that understood the traditions of the program recognized the importance of in-state recruiting, and perhaps most importantly, hated MSU and OSU. As with every rebound relationship, anything the new person did was received with a renewed vigor for the program, and while he was unable to defeat MSU in his first season, he did the next best thing, defeat a down OSU and win a BCS bowl game. Everyone began to drink the maize kool-aid coming off a successful 2011 season, Denard Robinson was a “way too soon” Heisman candidate and the team was ranked in the Top 10 in many preseason polls, despite having to replace 10 contributors from the previous season and uncertainty of knowing whether Hoke could get the job done with his players. Just as exciting as 2011 ended, the 2012 season commenced with disappointment as the team was dismantled by the eventual 2012 National Champion Alabama Crimson Tide in front of a national audience. While many Wolverines fans knew that the game against Alabama would be tough, they expected a more competitive game, and that did not happen. Despite finishing the year with a respectable 8-5 record, coaching decisions made in losses to Notre Dame and Ohio State caused some followers of the program to wonder if Hoke knew what he was doing or was the success in 2011 due to smoke and mirrors of an upperclassmen-laden team. One thing Hoke did know was recruiting. In-state and midwest recruiting became a priority again for the Wolverines as Hoke’s staff brought in 17 players from Michigan, 18 from Ohio and an additional seven players from neighboring states in two full recruiting seasons (2012/2013). Unfortunately, the luster from the inaugural 11-2 season in Ann Arbor continued to fade at a rapid pace as the team struggled through a six-loss season including two closer-than-expected victories over lowly Akron and UConn. Watching them lose to Nebraska the second weekend of November, I found myself asking if the Brady Hoke era could be more damaging to the program than what transpired under Rich Rodriguez. The missteps in Rich Rod’s tenure — neglecting defensive recruiting, not hiring a coach capable of teaching the 3-3-5 defense, and never embracing the Michigan way — were visible, but he was still was a good coach — unlike Hoke. Everything came unraveled in 2014. In addition to an abysmal 5-7 record that saw the team lose to conference newcomers Rutgers and Maryland, Hoke was at the center of a public relations nightmare as his coaching abilities were further questioned when he allowed sophomore quarterback Shane Morris to remain in the game against the Minnesota Golden Gophers despite showing visible concussion-like symptoms. He became the joke of local and national media for refusing to wear a headset during games and being a coach that was more about the rah-rah enthusiasm than x’s and o’s and player development. So after being shown the door at the end of the 2014 season, the search started again for the guy to rebuild the Michigan brand. It seems that this time the athletic department was able to get their guy in Jim Harbaugh and despite his quirks, he appears ready to restore order in the Big House. Have the missteps of the previous coaches created too much of a gap between the Wolverines and its rivals? People are waiting on Michigan State to come back to earth, but what if this is who the Spartans will be under Coach Mark Dantonio — a tough defensive minded program that keeps a steady quarterback under center and continually finds a diamond in the rough running back to run wild? Can Harbaugh develop the intensity needed to match MSU’s toughness? Even if you aren’t as talented as your opponent, you still must believe that you can beat them. That’s what the staff at MSU was able to instill early on, and it’s an identity that all players entering into the program were willingly buy into. The Spartans have laid to rest that little brother moniker and are looking to make the program a national power — while stepping on Michigan’s neck to do so. Urban Meyer, hate or love him, has turned OSU into an SEC caliber team above the Mason-Dixie line — in talent and mindset. After winning the 2014 National Championship, the Buckeyes have the golden keycard into the homes of the top recruits in the nation and similar to the staff at MSU, Meyer is creating a championship culture in Columbus. Ohio has always had more talent than the state of Michigan, and in previous years the Wolverines were able to steal a top player or two. However, If the winning continues in Columbus not only will it be hard to beat them for Ohio players but more top Michigan players could be enticed to cross the state line to play for a winner. Recruits in the class of 2016, 2017 and beyond recognize one program as the king of the state, and that’s the one in East Lansing. Yes, Michigan will always get its share of in-state players, but now most potential recruits only know about State having the upper hand and Michigan being the team that is on its third coach in five seasons. Can Wolverines fans be ok with Harbaugh only leading the team to seasons of nine or 10 wins with the losses being to one of its rivals — if not both? Can you call yourself the “leaders and best” if you are continually looking up to those two teams in the standings and never contending for a Big Ten title? And what happens if the NFL comes calling again– because we know it will — would the lack of success in the game on the last Saturday of November be the convenient trap door exit for Harbaugh who realizes that the collegiate game isn’t as rosy as it was when he was leading Stanford? And if he does, what would be Michigan’s next move?